This is one of the most challenging treks in Ladakh. As we have to cross several passes of around 5000 meters each on our way. We will go through several deep gorges which link Zanskar to the Indus Valley Region. There are remote trails with absence of villages and settlements thus bringing true adventure for the trekkers. Zanskar range includes several peaks above 6000 meters and multitude of high ridges and rock spires. The region is known for its wildlife like brown bears, Ibex, Snow Leopards and Wolves. Herds of Urial and Blue Sheeps can also be found on the high ridges. We will cross Cha Cha La (5000 meters) where the trail through the gorges is often prone to landslides thus crossing boulders and negotiating rubble become difficult for horses. We have to cross a lot of water streams thus we are mostly trekking in wet boots and pants. There are some ancient palaces, gompas and monasteries to expose the ruins of the kingdom of Zanskar, which once dominated the region. Once you step into the isolated terrain, thereafter, at every turn you will come across surprises. We will pass through tricky moraines and narrow ridges. The trail also provides panorama views of the Gigantic twin peaks of Nun and Kun and far-fetched valleys and climbing over high altitude passes like Cha Cha la, Rubang La and Kongmaru La. After Acclimatization and sight seeing at Leh, we will start our drive towards Karsha via Kargil through desert, We will visit at the Confluence of the River Indus with River Zanskar at Nimoo on a terrain that resembles more like a surface of the moon. We will also visit the Monastery at Lamayuru built in the 11th century and one of the oldest in Ladakh. We will come across Fotu La (4100 mts) shortly after leaving Lamayuru and enjoy the Ladakhi Landscape and dry riverbeds as well as Mt. Nun and Kun, the highest peaks of the region at an altitude of 7135 mt and 7070 mt respectively. Views of River Indus while crossing Suru Valley. The road from Kargil to Karsha is more like a dirt road, but this road offers some spectacular views and is at an average altitude of 3750 meters. Before starting our trek we will spend some time in Zanskar Valley, visiting some impressive monasteries of Tongde, Zangla, Karsha and Sani. There are many restaurants and hotels and you need to watch out for your belongings as there are cases of theft in this region. Enroute we can visit the famous Dogra Fort from 1830's build by Zorawar Singh when he first invaded Zanskar. We will also visit Karsha Monastery which is the largest monastery in Zanskar. We will visit the main courtyard to enjoy the amazing views of Zanskar Ranges from up there as well as Assembly and Prayer Hall. It's a 10th century Gompa with a big prayer and assembly hall thus a lot of monks from nearby valleys visit here to attend prayers. We start our trek from Karsha and move towards left bank of river towards Pishu Village. Its a short trek with ample time to savor the awesome views of jagged ridges of Zanskar. There is a a road which leads all the way to Rinam, however walking is good for acclimatization as we have to climb high passes in the coming days. We take the main trail from Karsha, which is dry and dusty route sometimes with the pleasure to walk across river beds. In two hours we reach Rinam (3500 meters) and have a short break here. 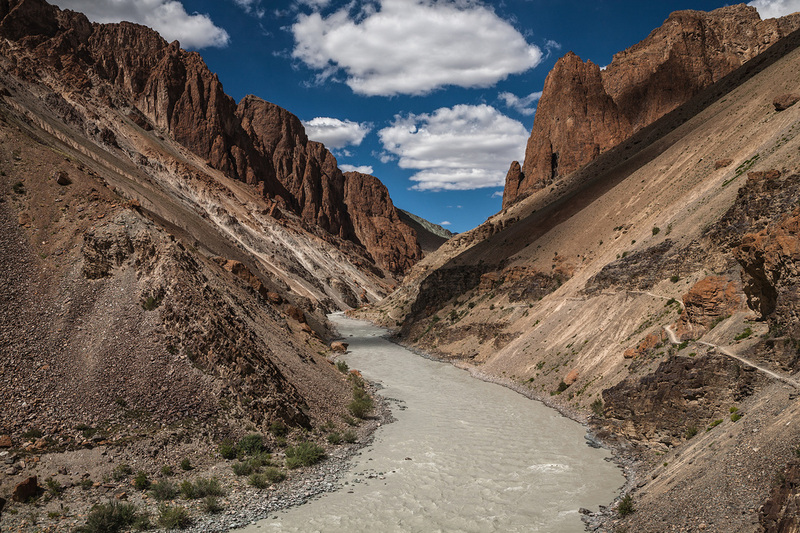 There is another 7 kilometers walk alongside Zanskar River until we reach Pishu. The entrance of the village is marked by Mani Walls (Inscripted Stone) and Chortens (Stupa). There is a green campsite close to the river. From here we proceed our trek towards Zangla Village after crossing a bridge over the Zanskar River and heading towards the dirt road to the outskirts of the village. There is a small nunnery an a fort from where we can enjoy commanding views of Zanskar Valley. The largest house of Zangla belongs to the King of Zangla. The Zangla Gompa is a little far away from the village and is administered by the head monk of Spitok. After leaving Zangla we enter remote regions of Zanskar filled with deep gorges and high passes. From now on there would not be a village till we reach Indus Valley. As we pass the fort we will come across some Chortens (Stupas) and pass through a narrow gorge to reach the hydro electric project. We walk along the right side of the gorge till we reach a river crossing. The trail then takes a long walk through willow thickets for 5 kilometers before the gorge opens up and there is a wide valley ahead of us. We reach our campsite after following a tributary towards a plain area. We start our climb eastwards today towards a valley. We walk along the scree to push the final ascent towards the pass, which is steep for the final 300 meter. We get beautiful views of Himalayas and ridges and gorges of Zanskar which are breath-taking. From here the trail descends towards the source of a stream and at times through extremely narrow gorges and streams thus making us pull off our boots. After a long walk we reach the confluence of two gorges and our campsite which is a soft bed at 4000 meters perfect for camping. Today will be walking across a remote and barren country through gorges which receive very little sunshine. Very few trekkers cross this territory. We walk through numerous streams with usually wet shoes enough reason to numb our feet. At some places the water level will be too high thus its advisable to cross before 10 Am and leave early. Else split our trek in 2-3 days thus making it easier to cross. There will be many rock caves in way for shelter an rest and there are a lot of twists and turns thus stay with your guide at all time. There will be many confluence of rivers but finally after reaching the confluence of Khurna River we will be able to watch prayer flags indicating our camp site on the opposite bank. We will cross the river again to reach our campsite. Stay with your guide at all times and follow his instructions on crossing the river. 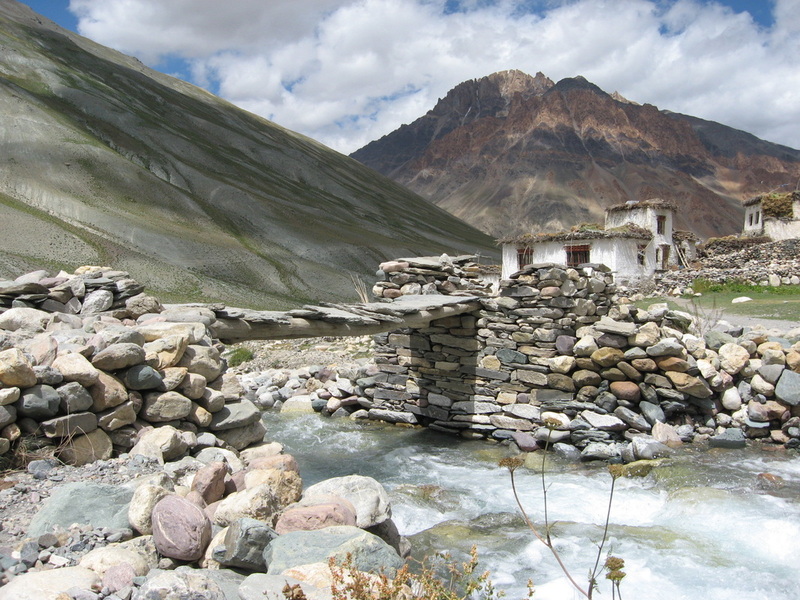 It's a beautiful campsite along the river bed located at 3750 meters. This day will be as remote and challenging as the previous 2 days we have been facing. However we will be crossing more river streams and tributaries this time, thus more wet feet. Here your will get in terms with true dimensions of the vastness of this barren unexplored and inhabitable region. We start early by crossing the waist deep water of Khurna River. Be careful and follow your guide. There is no trail and we have to follow the course of the gorge and switching river banks as the terrain demands. There are two dozen river crossings before we reach the confluence of Khurna River. We can also burn a fire here to dry our clothes and shoes near the site close to prayer flags and make a stop over for meals. A few kilometers from here we come across an narrow gorge and the trail winds up above the ridge and descend back towards the gorge. As the gorge widens we ascend over boulders and willow thickets until we reach a grassy campsite and flat land where Bharal Sheeps can be seen grazing the vegetation above the camp. We retire here after a long, adventurous and tiring day. Today will be another challenging day as we will be passing Zalung Karpo La. We will ascend for three kilometers before ascending a small gorge. From here there is a turn off towards Markha Valley towards Rubrang La (5050 meters). This is an alternate route which will lead us towards Markha Village and thus forms an alternate trek route. However we come back to climbing to Zalung Karpo, so we will climb until the gorge widens up and we will have views of the pass. We ascend and go through switchbacks to reach the top of the pass. Here we can enjoy beautiful views of Rupshu and tall 6000 meter peaks on the other side. The pass opens up gateways to two different regions, one is toward Rupshu and the village Dat and the other goes down towards a ridge with prayer flags and drops towards a steep gorge. From here we reach our campside which is filled with grasslands situated at an altitude of 4700 meters. Today will be a relatively easy day trekking day towards Nimaling. We cross a narrow gorge to reach a Mani Wall (In scripted stones) and a stone shelter. We can see Kangyaze Peak from here (6400 meter) dominating the valley. We head down crossing several river streams before reaching a bridge over a confluence. As we cross the bridge we turn right and ascent to reach our campsite. We camp here tonight. From Nimaling we can also take an extra day and climb towards the base of Kangyaze and have nicer views of Zanskar by heading south towards across a series of pastures. As today we will be climbing the Kongmaru La we start early for a very demanding stage of the trek. There is a visible trail as we follow it we come across a stream which we have to cross. From there we climb a ridge which follows the base of Kongmaru La. From here there is a steep ascent towards the top. We enjoy magnificent views as we reach to the top. The pass is defined by colorful prayer flags. On to the north we can see the whole Ladakh Range and the deep route down towards Indus Valley on the other side towards south we can see the magnificent Kangyaze Peak from up close and the snow capped ridges of Zanskar Range. We can also see some Bharal Sheeps grazing on nearby mountains. From here there is a steep descent of 500 meters where we will make a stop over for lunch near a small shepherd encampment. From there we enter a narrow gorge and cross the stream several times while descending steeply. Further down the gorge widens and we can see some green pastures and flat area. We continue further from here for a few kilometers on a site above the riverbed which is called Shang Sumdo. Its a beautiful campsite and favored camping area for trekkers. There is also a monastery named Shang Gompa on a little distance from here. We camp here tonight after a long and tiring day. Today will be an easy day we trek our ways across towards Hemis Village. As we follow the trail leading to Sumdo Gorge, we cross some Stupas and In Scripted Stone Walls that take us to scree slopes leading to Hemis. We can see the trail meeting the road coming from Indus Valley just above the village. We can stop over for a while to visit Hemis Village and Gompa. It's one of the most important monastery in Ladakh. It's the main gompa of the Drukpa order and was established in 17th Century under Singge Namgyal the famous ruler of Ladakh. It has patronage of royal family. The Annual Hemis festival is famous in Ladakh and is held in June/July. Tourists and visitors from throughout Ladakh come to attend this festival of masked dances commemorating the deeds of Sage Padmasabhava the introducer of Buddhism in Himalayas. A number of musicians play the traditional music with four pairs of cymbals, large-pan drums, small trumpets and large size wind instruments. Next to them, a small space is assigned for the lamas to sit. From here we will conclude our trek as our jeeps would be waiting to transport you back to Leh.